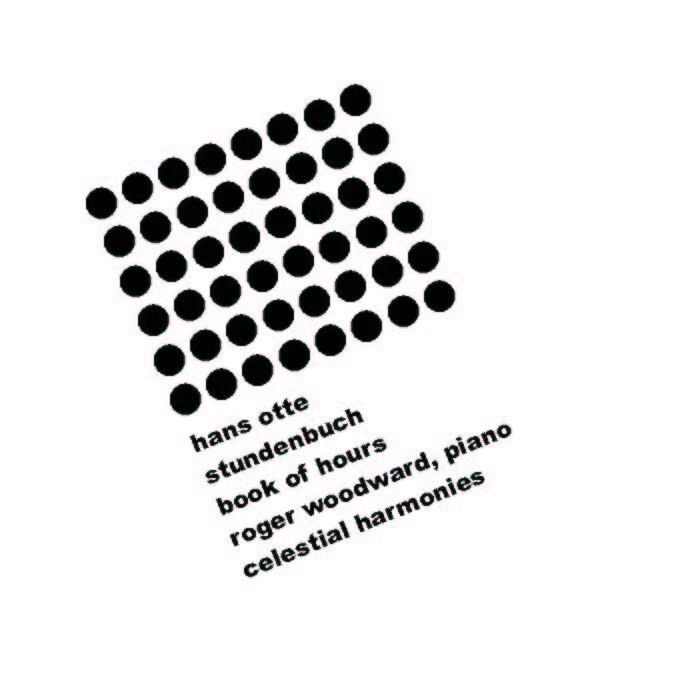 It is fitting that Hans Otte's STUNDENBUCH / BOOK OF HOURS, recorded by pianist Roger Woodward on a Bösendorfer at the Radio Bremen concert hall, is a co-production between Celestial Harmonies and Radio Bremen. The piece was commissioned by Radio Bremen for its Pro Musica nova 1996, the highly regarded biennial festival for contemporary music founded (in 1961) and directed (from 1962) by Hans Otte, during his tenure as Head of Music at Radio Bremen (1959 to 1984). Through this festival, Otte had opened doors to countless composers, had given opportunites to realise ideas and concepts, and had helped composers such as John Cage, David Tudor, La Monte Young, Nam June Paik, Steve Reich, Terry Riley, Karlheinz Stockhausen, Mauricio Kagel, György Ligeti and Dieter Schnebel. Quoting from Hans Otte's programme notes for the Pro Musica nova 1996, "Since 1991 I have once again been working on a large cycle for piano. There can be no better challenge for any composer than writing for this instrument, which has been so closely involved in developing the new musical languages of this century. "Music is about listening', as Rauschenberg once said, and it is important for any composer of today to learn from the great artists of the century. As Matisse and Picasso began to eliminate the duality of pictorial space, and Jasper Johns and Rauschenberg continued fifty years later, the change in art toward independent moments of visual perception, where every glance is the present, became clear. And in music it is quite similar, where a non-dualistic experience and conception can offer the listener the freedom of every moment, the liberation from recollection or expectation. In my Stundenbuch I have attempted to follow this path. The whole cycle consists of smaller and larger pieces that follow each other without interuption." Writes pianist Roger Woodward, "In the closing years of the twentieth century, perhaps it comes as no surprise that the Bremen pianist-composer, Hans Otte, disciple of the visionaries Walter Gieseking and John Cage, emerges as the unsurpassed master of the sublime, lyric poetry with his composition of a true masterpiece in moment form for piano entitled STUNDENBUCH / BOOK OF HOURS. "In a universe of exalted, fragmented but delicately-balanced sonorities, the audacious design of time-suspended galaxies in Otte's highly-intimate, miniature-art and enigmatic but constant shift of movement and mood, form four books in twelve parts each, to span a golden arc extending from prima and seconda prattica to the sonnets of Shakespeare; divine melodic genius of Mozart; inscrutable logic of late-Beethoven; Elysian fields of Schubertian Ländler and Chopinian cantilena of the Nocturnes, in poetic homage and as an inclusive part of his magnificent North-German inheritance." Roger Woodward studied piano at the Sydney Conservatorium of Music, University of Sydney, with Prof. Alexander Sverjensky (a pupil of Sergei Rakhmaninov) and in the class of Prof. Zbigniew Drzewiecki (a pupil of Ignazy Paderewski and lifelong friend of Szymanowski and Artur Rubinstein) at the National Chopin Academy of Music, Warsaw. The London Guardian described him as a "pianistic genius"; Le Monde de la Musique, Paris, for his Debussy performances, as "magnificent"; and in Edinburgh, he was described as a "musician's musician". The Financial Times, London, called Woodward "one of the most consistently exciting and convincing interpreters of virtuosic avant-garde music." For Celestial Harmonies, Roger Woodward has recorded Fryderyk Chopin: The Complete Nocturnes (14260-2), Peter Michael Hamels' Vom Klang des Lebens / Of the Sound of Life (13256-2), Hans Otte's magnum opus Stundenbuch / Book of Hours (13259-2), Fryderyk Chopin: Piano Concerto No. 2 F Minor Op. 21 / Ludwig van Beethoven: Piano Quartet No. 3 C Major Wo0 36 (13277-2), Claude Debussy: Préludes, Books 1 & 2 (13279-2) and Johann Sebastian Bach: Chromatic Fantasia and Fugue BWV 903, Partita No. 2 BWV 826, Partita No. 6, BWV 830, French Suite No. 5 BWV 816 (13280-2). As a pianist, composer and radio programmer in Bremen, Hans Otte left his mark on contemporary music over a period of more than six decades. Because he was never inclined to be an insistent self-promoter, his various uvre has not become as well known as the solid integrity of more than a hundred musical, literary and visual works would justify. His extraordinary musical talent was revealed early and during his childhood and youth, he found himself in good hands. His teachers recognised his talent and supported it with all their energy: above all the pianist Bronislaw von Pozniak (1887-1953) and later Paul Hindemith (1895-1963) and the organist Fernando Germani (1906-1998). For Kuckuck Schallplatten Hans Otte has recorded Das Buch der Klänge / The Book of Sounds (11069-2) and Das Buch der Klänge / The Book of Sounds / Stundenbuch / Book of Hours / Face à Face (12069-2), a special limited edition released to celebrate the composer's 80th birthday. 1 1'09" 13 2'17" 25 1'02" 37 1'06"
2 0'57" 14 1'20" 26 0'30" 38 0'51"
3 1'17" 15 1'33" 27 2'13" 39 0'53"
4 1'04" 16 0'45" 28 1'00" 40 0'57"
5 1'02" 17 1'35" 29 0'47" 41 1'05"
6 0'40" 18 0'55" 30 0'59" 42 1'28"
7 1'12" 19 1'04" 31 1'03" 43 2'41"
8 0'52" 20 0'57" 32 0'51" 44 1'18"
9 2'26" 21 1'13" 33 0'46" 45 1'21"
10 0'55" 22 1'05" 34 1'40" 46 1'04"
11 0'58" 23 0'53" 35 0'53" 47 1'07"
12 1'21" 24 1'45" 36 1'12" 48 1'05"